Hello, forex friends! Aside from Canada’s jobs report, tomorrow (November 2, 1:30 pm GMT) is also gonna be another non-farm payrolls (NFP) Friday! More importantly, tomorrow’s NFP report is the last NFP report before the December FOMC statement, so chances are good that the Greenback may get a volatility infusion. Non-farm employment in October saw a net increase of 161K, which is fewer than the expected net increase of 176K. But on more upbeat note, it’s still above the 100K per month that’s needed to keep up with working-age population growth. Furthermore, the reading for September was upgraded from 156 to 191K while the reading for August got bumped higher from 167K to 176K. 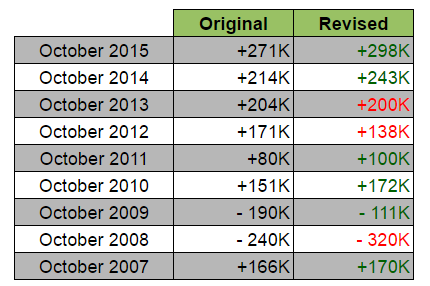 Those two upward revisions mean that the U.S. economy generated 44K more jobs than originally estimated. Moving on to wages, the average hourly earnings grew by 0.4% month-on-month, which is a tick higher than the expected 0.3% increase and faster than the previous month’s +0.2% pace. Better still, the year-on-year reading came in at 2.8%, which is the fastest annual rate of increase in seven-and-a-half years. As for the jobless rate, it ticked lower from 5.0% to 4.9%. However, the downtick in the jobless rate wasn’t really all that great, since the labor force participation rate also slid lower from 62.9% to 62.8%. The drop in the participation rate was due to a whopping 425K people leaving the labor force. This exodus pushed the total number of people not in the labor force to 94,609K, which is a high not seen since May. Overall, the October NFP report presented a mixed picture. In terms of rate hike expectations, however, the NFP report was still net positive. In fact, U.S. Fed Governor Stanley Fischer even used his media exposure shortly after the NFP report was released to say how good the report was. Quite naturally, the Greenback staged a rally as a knee-jerk reaction. However, the rally was short-lived. The likely explanation for this is that the NFP report was released on November 4, which is just a few days away from the November 9 U.S. presidential elections. Market players were therefore wary of loading up on the Greenback, because polls showed that Trump was gaining ground at Clinton’s expense at the time. And back then, practically all mainstream media outlets and many economists were saying that a Trump presidency would be catastrophic to the U.S. economy. Incidentally, the Greenback jumped higher come Monday when Clinton was cleared of yet another email scandal, which goes to show that events related to the U.S. election were driving the Greenback’s price action at the time. What can we expect this time? For the upcoming November NFP report, the consensus among most economists is that the U.S. economy generated 180K non-farm jobs. Economists are therefore expecting employment to grow at a faster rate compared to October’s 161K increase. Despite the faster jobs growth, the jobless rate is expected to hold steady at 4.9%. The average hourly earnings, meanwhile, is expected to continue growing by 0.2%, which is slower than the +0.4% rate that was recorded in October. Unfortunately, the very important ISM non-manufacturing PMI will be released next week, so we’re a bit handicapped here. Next, Markit’s flash services PMI reading for November dipped slightly from 54.8 to 54.7. However, commentary from the PMI report noted that payroll numbers continued to increase, albeit only at a “modest” pace. Additional commentary noted that the PMI readings are “consistent with non-farm payrolls rising by 135,000 in November.” This is obviously lower than the consensus reading, but it is bigger than Markit’s forecast of 130,000 back in October. Finally, the latest ADP report, uh, reported an increase of 216K jobs in November. This is more than the expected 161K increase but is also more than the previous month’s downwardly revised 119K figure (147K originally). Overall, the available leading indicators seem to be leaning towards a bigger increase in non-farm employment, so the consensus reading seems about right, with chance skewed more towards an upside surprise. Looking at historical trends, the U.S. economy usually generates a lot of jobs in November. However, seasonal adjustments depress the actual, unadjusted numbers. However, forecasts by market analysts tend to undershoot, resulting in more better-than-expected readings. 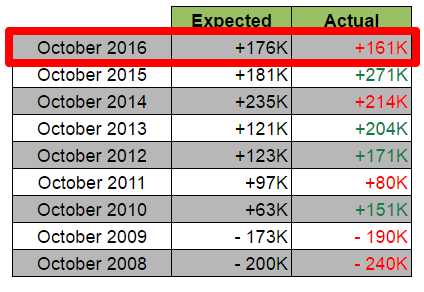 Also, seasonal adjustments mean that the payroll numbers for October get an upgrade more often than not. As always, just keep in mind that a 100K increase in non-farm employment is the “floor” that most forex traders are probably keeping their eyes on, since this is the number that’s often cited by many Fed officials, including Fed Head Yellen herself, as the minimum needed to keep up with working-age population growth. And by extension, this “floor” is therefore also the magic number that’s needed to keep rate hike expectations alive. If the actual reading is above 100K, then chances are good that the Greenback will still be getting some buyers. Although in case of a miss, the Greenback may dip first as a knee-jerk reaction. But if the reading goes below 100K, then the Greenback will likely get swamped by sellers. These are some of our favorite trading books if you want to get in deeper with macro economics & trading psychology. BabyPips.com receives a small credit from any purchases through the Amazon links above to help support the free content and features of our site…enjoy! I throw macroeconomics, forex trading, pop culture, and everyday life into a pot and hopefully, the final product are lessons about the FX market that's easy to understand. BabyPips.com helps individual traders learn how to trade the forex market. We introduce people to the world of currency trading, and provide educational content to help them learn how to become profitable traders. We're also a community of traders that support each other on our daily trading journey. Copyright © 2019 BabyPips.com LLC. All rights reserved.